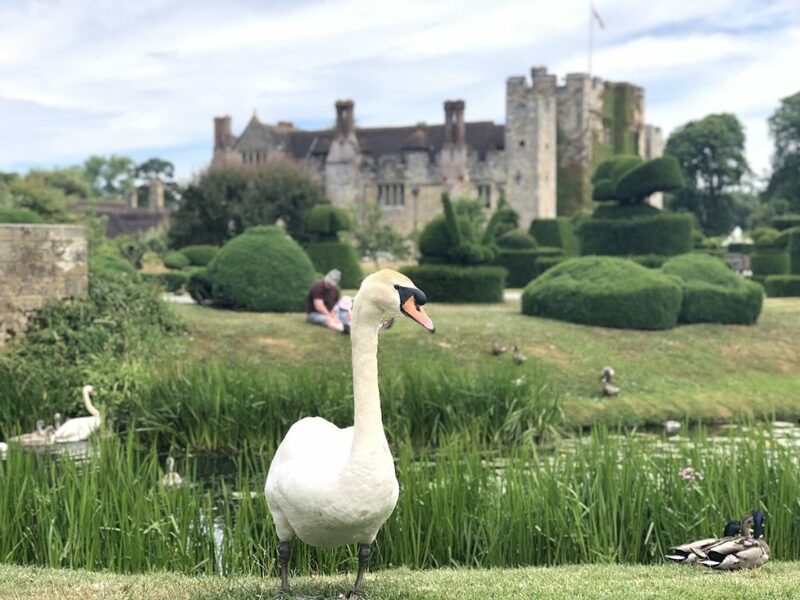 Hever Castle has got some amazing events on throughout the year and one that caught my eye was Hever's Home Front. The weekend event is held annually and offers guests the chance to discover life as it was in wartime Britain in the 1940s. It's always tricky to find events or activities for tweens and teens (who just want to stare at their devices or play online gaming), but I knew this would appeal to both of my kids and it would be educational at the same time – a win-win. Plus, from an interiors perspective, it would satisfy my love of retro style memorabilia – from ration tins and wartime posters, to old pill tins and sweet jars. I was looking forward to this! As Hever Castle was less than an hour's drive from home, the plan was to leave nice and early to get there for when it opened at 10:30am. It was all going rather swimmingly until the kids started arguing in the back. Once we'd sorted them out (we followed the rules of How To Survive A Car Journey With Kids), we could concentrate on getting ourselves there uninterrupted. Parking was a cinch and we were directed to the car park right next to the entrance. We entered the ‘Think Tank' tent first, where wartime books, displays and guns were on show. Both the kids held the guns and tried on the various headgear and then decided that they'd like to build their own model tank. 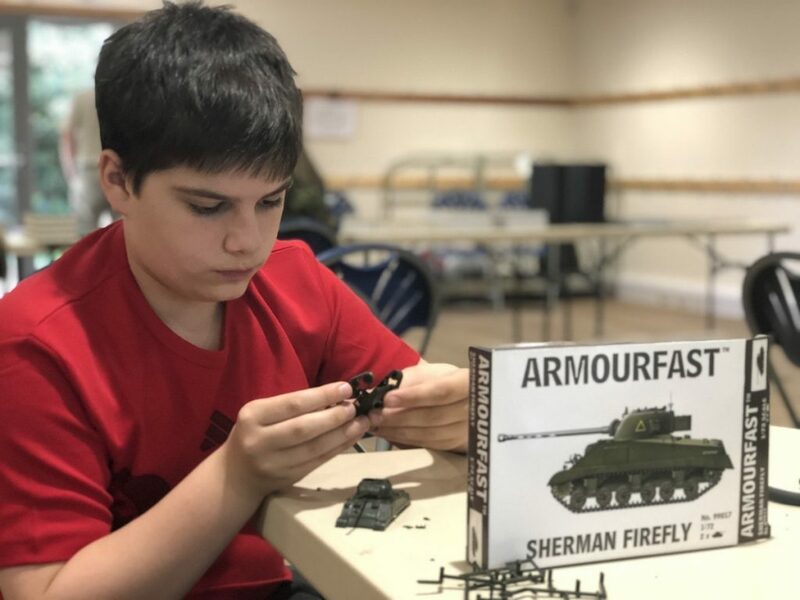 Luis (age 13) chose to build a Sherman Firefly, while Girlwrighter (10) opted for a Panther Ausf. G.
Staff were really friendly and kept checking that we had what we needed (glue, clippers etc) and praised the kids on how well they had done with their tanks, which encouraged them to get the job finished. Right next door there was a tented regimental museum which commemorated over 200 years of volunteer soldiering – from the Napolean era to the present day. Despite its size (restricted from being in a large tent), it was filled with plenty of information, interactive visuals and eye-catching audio and visual displays. By the time we'd finished in the museum, we all fancied a quick drink and a rest, but not before heading over to a row of huge tents adjacent to Hever Castle itself. I knew that once we saw the tents and got chatting to some of the reenactors, we'd be there for a while – and I wasn't wrong. We had a great conversation with a ‘1940s blacksmith' and learned how they used to make all sorts of things – from decorative brackets to spears. 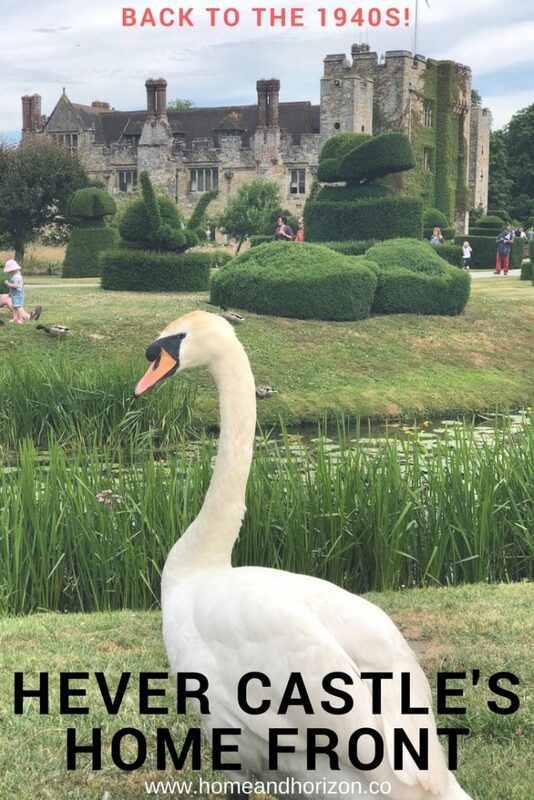 We then got a bit distracted by a beautiful swan and I couldn't resist the opportunity to experiment with the portrait setting on my iPhone and take a few snaps, featuring Hever Castle as the back drop – as you do. And then the kids found it hilarious that two ducks decided to have a fight. Incidentally, they were selling duck food, which was a great idea to get younger kids involved. 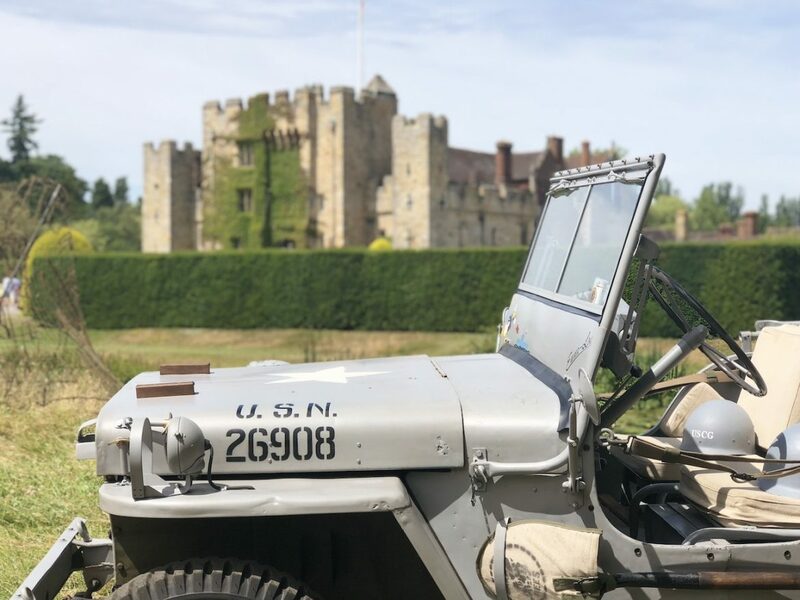 After a quick pit stop at the cafe for drinks and snacks, we checked out some more displays – including model boats, a real life-size Spitfire plus numerous armoured vehicles, and then decided to head into Hever Castle itself and marvel at its splendour. Hever Castle was the childhood home of Anne Boleyn, King Henry VIII's second wife. The castle’s collection of armour and weapons includes beheading swords dating from the 16th century! It's located in Kent – in the town of Hever – 30 miles south east of London. Back outside and there was the Home Front Bus to look around. Now I know a double decker bus is fairly big, but I have no idea how they managed to cram so much into it. It features detailed reconstructions of a 1940s shop, living room, shop, bombed out street and even an air raid shelter! We all enjoyed seeing some of the artefacts on display and marvelling at how they lived, what they ate and how they kept themselves entertained. I think it really hit home with the kids and they realised that they're actually very lucky to be part of Generation Z. After the bus, we saw some more stalls featuring US and Canadian army vehicles, authentic cooking, a 1940s salon and plenty of stalls to keep the kids out of mischief. 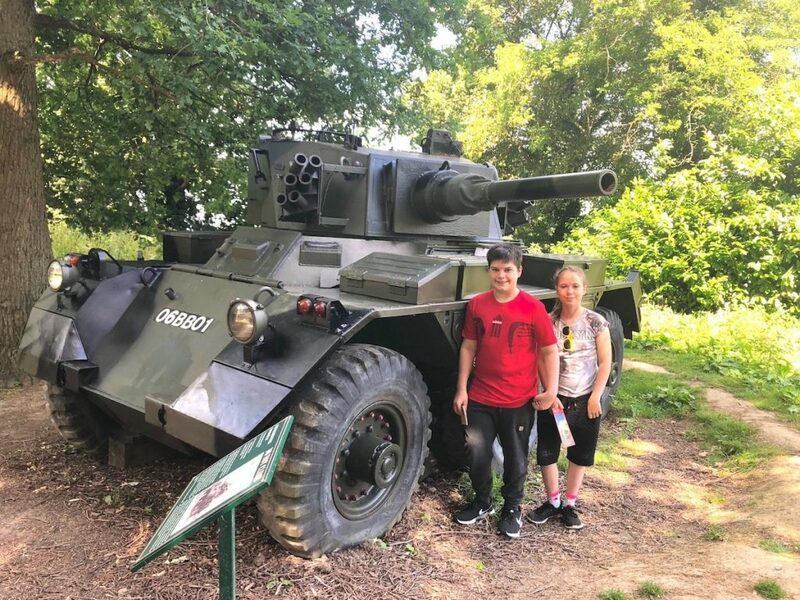 With £10 each to spend (kindly donated by their grandparents), Luis bought himself some wartime memorabilia as well as a couple of chocolate bars in nostalgic packaging, while Nadja found some sparkly earrings and a bracelet. I really enjoyed soaking up the atmosphere; the weather was great and everyone seemed to be in a great mood! One of my favourite things though was the dance tent. 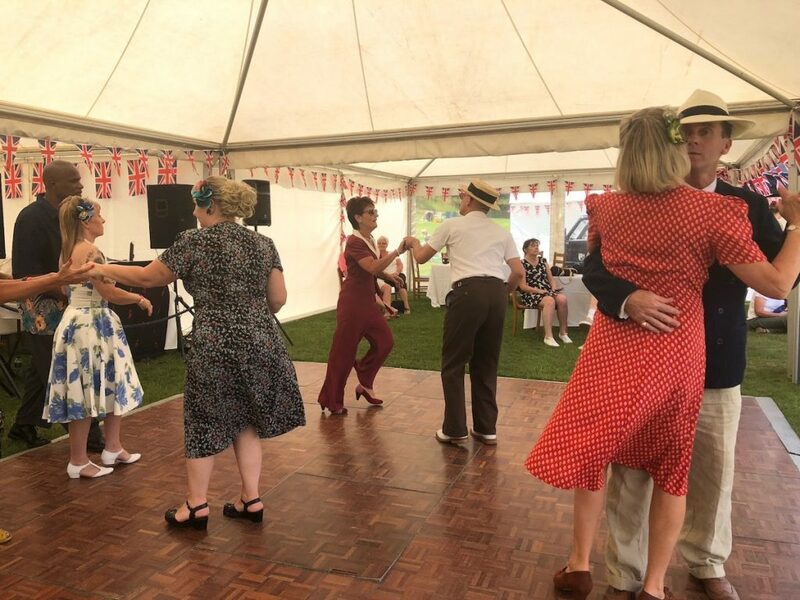 As the event encouraged visitors to come dressed in 1940s clobber, it was amazing to watch people who knew some of the dances and routines of 1940s hits. I could have sat there all day drinking lattes, soaking up the sun and listening to the jovial tunes. 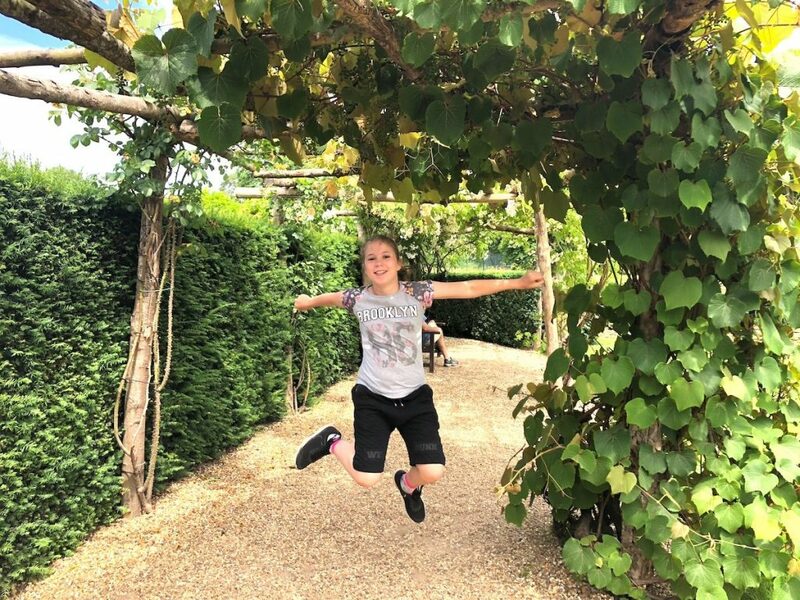 But it was time to eat, so we headed to the restaurant to tuck into sandwiches, stopping en route to enjoy the garden's maze, floral displays and perfectly manicured gardens. I can imagine that even in a rainy day, they'd still look absolutely amazing. By the time we'd finished, it was nearly time to head home, but not before enjoying a few more stalls and treating ourselves to ice creams. Hever's Home Front was one of those events that you can take anyone to and they'd enjoy it. I'm guessing the success of the event is weather dependent – as many of the tents and displays were in the gardens. Would I go again? Absolutely! 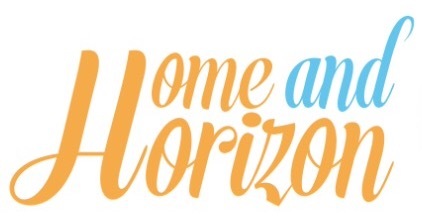 We all thoroughly enjoyed it – from the stalls and the model building to enjoying the maze and watching 1940s dancing – it was certainly a day to remember. If you're watching the pennies, you could take a picnic as there's an abundance of lovely spots to sit on the lawn and enjoy lunch with views. Alternatively, the onsite cafes and restaurant serve both hot and cold food, but they're a tad pricey. Online admission prices (for the Gardens only) are £14.50 for adults. Seniors are £12.95; Students go for £12.35; Children (aged 5-15) are £9.20 and the under 5’s go free. A family ticket costs £39.90 (2 adults & 2 children or 1 adult & 3 children) and there's also a discount for groups of 15 or more paying people. 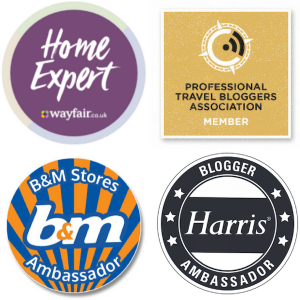 For further information check out Hever's website or give them a call on 01732 865224. 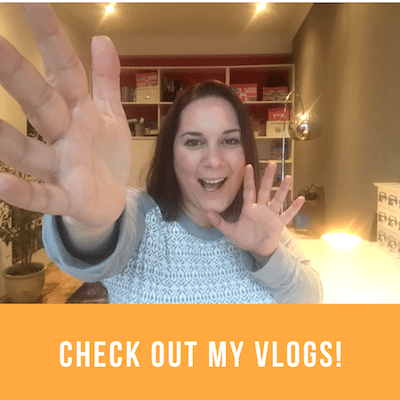 You've read about it – now watch the video! 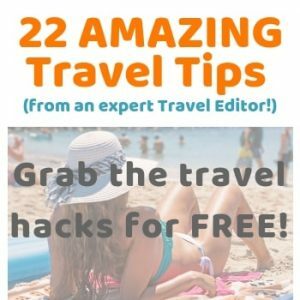 An Amazing Staycation? Here's How! Looks like an absolutely amazing day out!! 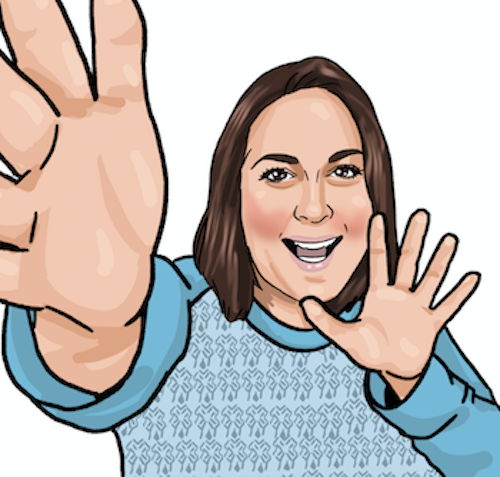 Thanks Lisa – we really enjoyed it! That looks fascinating; a really accessible way to learn about such an important period in history. It’s a great visual event – kids loved it too. Hi glad you enjoyed yourself I think I spoke to you I was the ARP warden with post 10 I have a website that let’s people know about 40s events around the country its http://www.1940sukevents com and next years Hever events is 22nd 23rd June 2019. Thanks again don’t forget Fort in the Forties Gravesend 29th 30th September 2018 another great event. That’s great – and thanks for sharing! This is the kind of visit I would love and knowing it isn’t too far from London makes me want to hop on the train! How come I didn’t know about this? I absolutely love Hever Castle! Think my kids would have loved to crawl over a tank. They run loads of events John – have a butchers at their calendar – I’m sure there’ll be a few events you & the kids would enjoy. Wow it looks fantastic, great fun for everyone! Wow, super cool events. It looks like the kids had a blast and that tank was something awesome to see. This sounds like such a cool event. I’ve never been to anything 40s themed before! It was the first time at a 40s event for me too – didn’t realise it would be such good fun. What a brilliant event! My oldest is really into the 1940s so I’d love to take him to this and I adore Hever Castle. Thank you for sharing. 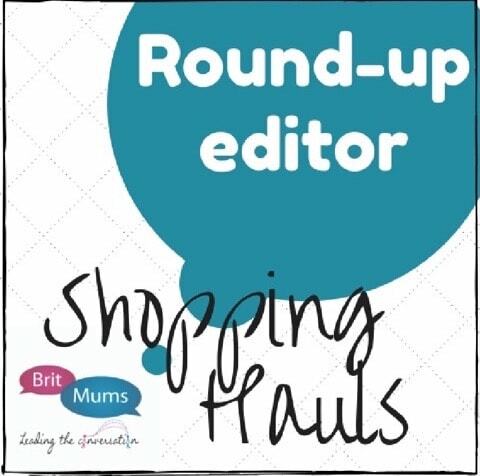 Thanks Becca – I’ve been recommending it to anyone that’ll listen! Thanks Kara – it’s great for the kids isn’t it? I like the sound of the event. It looks like you all had a great time. Lovely photos you got. The castle looks beautiful. It is a lovely castle isn’t it – possibly my favourite I’ve been to. What an amazing event! As a family of history lovers we’d have really enjoyed this. I love Hever Castle although haven’t been for years. I think I would love it even more with the 1940’s event! Love learning about wartime Britain. Great post. This sounds such a fun event! I would love to watch the 1940’s dancing, I can spend hours watching things like that. Ah it was great to watch the dancing – I wish I could dance like that. This looks like a VERY cool day out, one that I would have enjoyed myself! Some of the outfits were awesome! I tried to get VIP to have a dance but he muttered something about a beer, so that was that. Mind you, I’ve got two left feet so I don’t know how that would have panned out! Wow, This looks amazing! My parent would have loved to have gone to this! I love the picture of the tank!